It doesn;t really matter if your a serious trainer or a weekend warrior, tracking your runs is a key way to ensure that your fitness is heading in the right direction. On that note, enter MapMyRUN. This free app offers a host of features which are ehlping runenrs all aroudn the World to plan better runs and to get fit faster. Lets delve in. 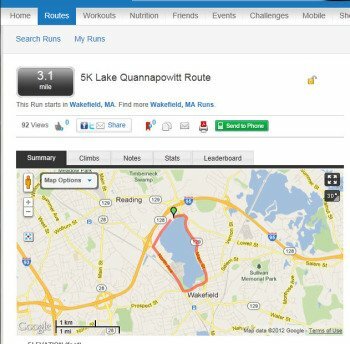 MapMyRUN scans your location to offer suitable running route suggestions. Getting started with MapMyRUN is a breeze: Sign up for a free account, and you’ll be good to go. Your options for planning and tracking workouts and nutrition are neatly laid out, in a tabbed interface across the top of the screen. From your Home screen, you can see your recent activity, including workouts you’ve completed and food you’ve logged. The app measures the distance and elevation of your run, allowing you to get quick feedback on your route, which is a useful feature for comparing your runs. I downloaded the free version of MapMyRUN which is ad-supported. The ads can be quite intrusive but there is a premium upgrade for those people who find them overbearing. Next articleIs your activity tracker making you fatter?